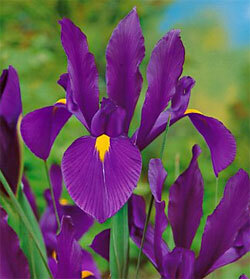 It is purple, and sensationally so-a vivid purple with a contrasting spot of yellow at the base of the petals. Blooms are carried a height of 22 to 28-inches are large, long lasting, and lightly but sweetly fragrant. Excellent cutting flower, at home in borders, and sensational when planted en masse. Even the dark green foliage is striking.